1. Electric Grill Brush – $28 – Boy, do I wish I had one of these. We’d grill outside more often. Our grill is caked with who-knows-what caked over the chrome. I brush most of it away, but a lot always remains. To the hardboiled, I know that means good barbecue flavor, but I can’t get over eating burnt meat grease. 2. 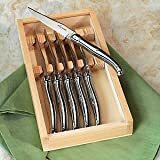 Laguiole 6-Piece Steak Knife set – $42 – This is a treat for steak lovers. These French knives, which look like the famous Laguiole pocket knife look great at a table set for meat. 3. Wireless talking BBQ thermometer – $49.99 We’re not saying you really need it. I mean, does anyone barbecue that much? But maybe the dad on your list does like to bbq while watching the news and needs a reminder call if you really want to consistently hit medium rare. 4. Grilling Tool Set – Even the best of tools need to be replaced. Dads will appreciate this storage case when everything is put back the way they found it ready for next time. We can’t vouch for this set, though it looks like the one we use. You don’t have to pay an arm and a leg for a good set, but make sure the tools are more than 20″ long so dad doesn’t burn the hair off his harms when cooking dinner. 5. 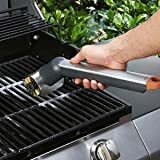 Weber Chimney Starter – $14 – If the dad on your list is still using lighter fluid, this is a simple tool he has to have. It uses just one page out of the newspaper to get the fire started. That means less noxious fumes and less chance you’ll be eating lighter fluid in your burger.